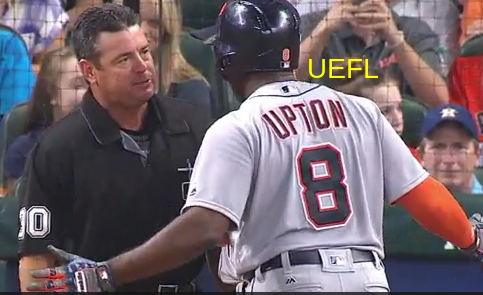 HP Umpire Rob Drake ejected Tigers LF Justin Upton for arguing a strike three call in the top of the 7th inning of the Tigers-Astros game. With two out and one on, Upton took a 1-2 slider from Astros pitcher Pat Neshek for a called third strike. Replays indicate the pitch was located over the heart of home plate and below the midpoint (px 0.169, pz 3.492 [sz_top 3.510]), the call was correct. At the time of the ejection, the Astros were leading, 5-4. The Astros ultimately won the contest, 5-4. This is Rob Drake (30)'s first ejection of the 2016 MLB regular season. Rob Drake now has 4 points in the UEFL Standings (0 Previous + 2 MLB + 2 Correct = 4). Crew Chief Gerry Davis now has 3 points in Crew Division (2 Previous + 1 Correct Call = 3). This is the fifth ejection of the 2016 MLB regular season. This is the 3rd player ejection of 2016. Prior to ejection, Upton was 0-4 in the contest (2 SO). This is the Tigers' 2nd ejection of 2016, 1st in the AL Central (DET 2; MIN 1; CLE, CWS, KC 0). This is Justin Upton's first ejection since May 23, 2015 (Clint Fagan; QOC = Y [Balls/Strikes]). This is Rob Drake's first ejection since June 27, 2015 (Brett Oberholtzer; QOC = U [Throwing At]).